Six dead and more than 20 injured as van plows into people on London Bridge. At least six people were killed in a terrorist attack in central London on Saturday night, the BBC reports. 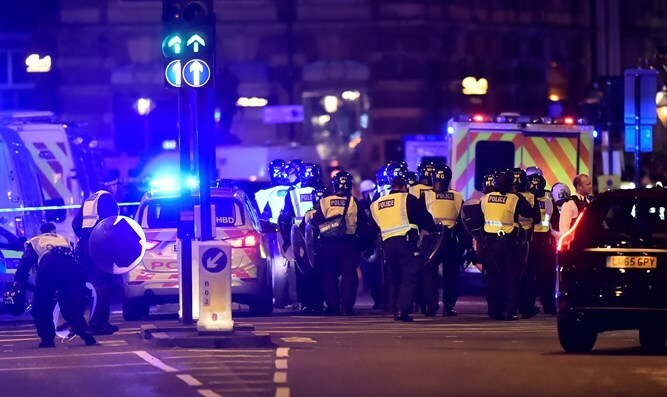 Police and ambulances were alerted to reports about a van that hit people on London Bridge shortly after 22:00 local time. London Ambulance Service said at least 20 people have been taken to hospital. A number of people were treated at the scene for less serious injuries, according to the BBC. Police said three terrorists were involved in the attack, and it is believed all three were eliminated. Prime Minister Theresa May described the incidents as "dreadful events", while London Mayor Sadiq Khan said it was an "horrific terrorist attack". "The situation is still unfolding and I would ask all Londoners and visitors to our city to remain calm and vigilant,” added Khan. "We don't yet know the full details, but this was a deliberate and cowardly attack on innocent Londoners and visitors to our city enjoying their Saturday night. I condemn it in the strongest possible terms." May said, "Following updates from police and security officials, I can confirm that the terrible incident in London is being treated as a potential act of terrorism." "This is a fast-moving investigation. I want to express my huge gratitude to the police and emergency services who are on the scene,” she added. Eyewitnesses told the BBC they saw between two and four people getting out of the van after the attack on the bridge and running towards Borough Market. Gunshots were later heard in the area while one social media user posted a photograph appearing to show one of the attackers lying on the ground outside a pub in the food market, with what seemed to be canisters strapped to his body. U.S. President Donald Trump offered his help to Britain, tweeting "WE ARE WITH YOU. GOD BLESS!" French President Emmanuel Macron said France was "more than ever at Britain's side." The attack comes almost two weeks after 22 people died in a suicide bombing at a concert in Manchester. In March, five people were killed in London when a car was driven at pedestrians on Westminster Bridge and a police officer was stabbed outside Parliament.